The Google Keyword Tool is well known as a good tool to find good keyword suggestions. Google gives a good overview of which keywords are popular, how much is advertised on them, and how expensive an ad would be. For you, as a (potential) owner of a website, this is also relevant information. But something is lacking. What is the use to know which keywords are popular, if hundreds of thousands of websites are aiming to rank high for the same keywords? You will never rank high in the Google results for the most popular keywords! Or do you really think you can beat the big guys for keywords like "travel", "fashion", or "antique"? Our Keyword Analysis Tool will show you how to find these keywords. 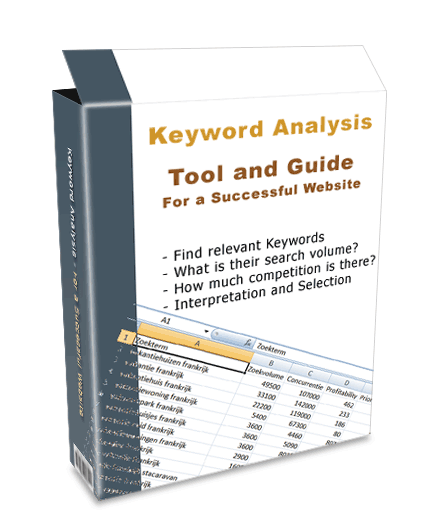 This tool and accompanying e-book contains everything you need, to do a thorough investigation for the best keywords. The result is a list with keywords, and a blue print for building a successful website. Aren't there other keyword tools to perform this task? Most of the available tools aim at finding the search volume only. While it is the combination of search volume and competition that determines the suitibility of a keyword. The first drawback is acceptable. Especially if the website package is any good. (And SBI is very good, in fact). But maybe you're not ready to buy a complete package. Once you have a list with keywords however, which you know you can be successful with, you might realize that such an investment may be worth it. If you are ready for investing in a hosting package including a keyword tool (SBI in particular), you have to realize that the keyword tool in these packages are only usefull for English websites. The lack of a keyword tool for non-English keywords in fact removes the foundation of the complete package. Good keyword research is essential for the rest of the package. With our Keyword Analysis Tool and Guide you can now find your most valuable keywords in any latin character language (if you want to try it in a non-latin character language, contact me, I'll give you a free trial). And after you have found your list of suitable keywords, you can invest in your successful website. And if you buy SBI via us, you'll get a full refund for the Keyword Analysis Tool and Guide!! There is enough information online about the importance of keywords, but here's a short explanation. These are the important characteristics to judge a keyword. In the introduction you'll get a short overview about how we'll get these figures and use them. 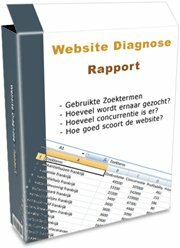 Explanation about this tool, with our advice how to use it, and how to export the keywords. The Search Volume is one of the important characteristics of a keyword. What do the values mean, what are the options to be chosen, and which values are OK or not? Complete explanation about importing in Excel, but also a reference to other, free spreadsheet tools. Make a first selection based on search volume and relevancy. For use in the Keyword Analysis Tool you need to export your list of keywords. But first, we will throw away the irrelevant data. You will get a step by step explanation how to do this. Download and installation of the necessary programming environment. No worries, you don't need to do any programming. But this environment is the necessary to run the Keyword Analysis Tool. You will learn how to install it. What do the values for Competition and Profitability mean? Why are they important, and what are good or bad values? You can sort your resulting list of keywords in different ways. To choose the best keywords, an analysis of all characteristics is necessary. We developed a method for a quick interpretation of your keyword list. We assign priorities, and with a multi-level sorting scheme you will get a good overview of your best keywords. As a bonus, the Keyword Analysis package contains an extra tool, which investigates the competition for a keyword in different ways. What are these different ways? When is it useful to use these methods? And how do you need to interpret the results? These are all questions we will give you the answers to. Especially for the user who wants more, and who wants to build a large website in a very competitive niche. Chapter 6 - What's Next? A short chapter about the next steps to take. You now have a list with suitable keywords, a blue print for your website. We will give an explanation about how to continue creating that website, and how we can help you with it. It might happen that the tool doesn't work the way we decribed it. This may have different causes, which we mention here. 99% of the problems can be solved with these instructions. With the Keyword Analysis Tool and Guide you will have a quick insight in your website's potential. Many websites are built without doing this research. They are just sitting there online, attracting only a small amount of visitors. Your investment in a Website is useless without proper research!! You can now perform that research yuurself. The choice is yours. Building a website costs a lot. Make sure that that large investment doesn't become useless.